We love it with salami & crusty bread. Our unique Dutch inspired mix. 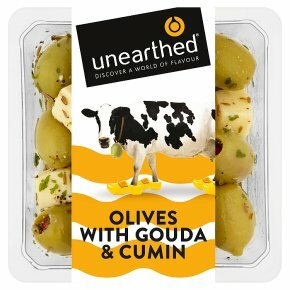 Suitable for vegetarians.Our Food Discoveries Olives with Gouda & Cumin The Dutch City of Gouda is famous for a Semi-hard cheese made from cow's milk, but in true unearthed®style what you see before you is somethingrather special. One of our intrepid flavour finders discovered this incredible cumin-spiked version on a recent visit, fell in love with its distinctive flavour and convinced us to launch it in the UK. One nibble and you'll know why. Warning: While every effort has been made to remove olive stones some may remain. Gouda made with pasteurised milk and vegetarian rennet.